Students performing a Greek tragedy were hoping for fine weather this week, as they staged a play outdoors. Pupils at Samuel Ward Upper School and Technology College in Haverhill gave two outdoor performances of For the Love of a Nightingale as well as two indoor performances of Oh What A Lovely War. A total of 20 year 12 students and five year 13 students were taking part in the plays as part of the AS and A-Level examinations, with the examiner attending performances. Drama teacher, Karen Packwood said the had some problems with strong wind blowing the scenery around but otherwise rehearsals has been going well. It was decided to perform the Greek theatre outside as this would have been its original setting. The production of Oh What A Lovely War used various nationalities and uniforms to help raise pupil awareness of the effect of war on all countries. Did you see the productions? 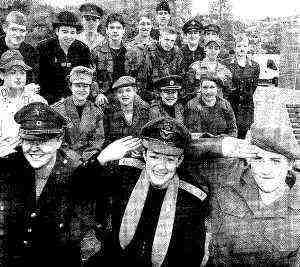 CAPTION: Taking the salute … front from left, Lucy Millar, Katherine Parkin and Yvonne Beddow with fellow students from Samuel Ward Upper School and Technology College in haverhill who are taking part in Oh What A Lovely War.